Bathroom remodeling offers a way to update your home, but it also gives you a chance to make your bathroom a retreat of sorts, where you can go and relax after a stressful day. Bathrooms for some reason tend to carry the trends in the permanent fixtures more than any other room in the house. The pink or olive colored tub, sink and toilet combos were big in the 70s and 80s. That isn’t seen as beautiful aesthetically anymore and we’ve moved more to the unique with fixtures. Many people are going for the more neutral colors and styles of fixtures, which add to the resale value of a home and appeal to more people instead of trend. Here are some suggestions on how you can update and still hold the resale value of your home while creating a retreat. Many homes have the standard bathtub that don’t make it realistic to take a relaxing bath. It is a two part bath while you’re in there. Part one is sitting to get your legs and low back and torso. Then part two is laying down to get your whole back and neck in the soothing water while your knees and legs are cold outside of the water. This whole process isn’t as relaxing as it could be with a soaker tub. Therefore, one way to for a bathroom remodel in which you install a soaker tub. This can take the place of your standard sized bathtub/shower combo, without adding any additional space for the bath/shower. There are many soaker tub designs and sizes nowadays, so shop around and find out what your options are before buying a new standard sized tub in an updated color. SOD Builders can help. 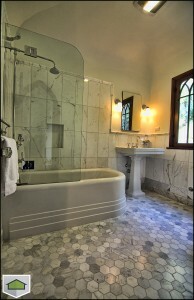 We offer bathroom remodeling for all budgets and project sizes. Contact us for a free consultation today! Please do not submit if you are a Solicitor. Thank you. ©2017 SOD Builders® All rights reserved.